It's officially summer. Summer makes me think of picnic-ing in the park, reading a book by the beach and running after the ice cream truck when I was a kid. That's my idealized summer. In reality, summer for most of us still means going to work even if it's gorgeous out, and squeezing in some outdoor time during the week. I love the concept of picnics but the closest I've come to one this year, was last week when I bought a taco from the Endless Summer truck and ate it sitting down by the parking lot around the corner. That's why I'm going to do a series of posts this summer on perfect picnic food. Hopefully to encourage you, and me, to plan some meals in the great outdoors, or at least near a tree. I made this little salad one night when it was too humid to think about using the stove and I had a lot of leftovers from the mixed greens salad I made for dinner. I threw this together thinking it would benefit from a night in the fridge and I'd have another lunch (or dinner) without cooking. It worked. 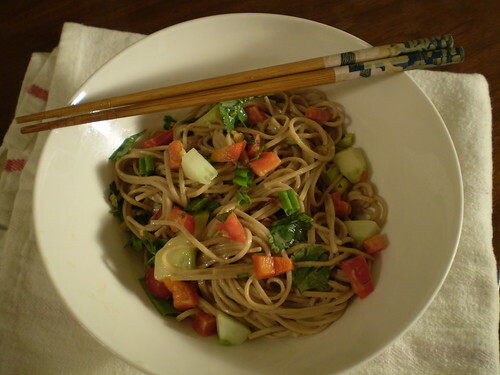 I decided to make this my first post in the picnic series, because even though it's not novel, it's easy and hearty, no need to cook pasta or another grain. It's the type of salad that you can and should dress the night before. It's an all-in-one package picnic food, no need for separate bottles of salad dressing or a knife. Unless you're the type that has a wicker basket, and a wine glass holder for the grass (I've seen this in person), unfussy food is the only food you should picnic with. And, if you are that person, here's hoping the cops arrest you for so unabashedly drinking in the park. Make this the night before or at least a couple of hours for the flavors to combine. 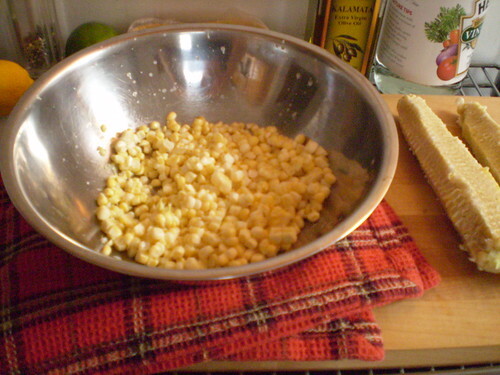 Rinse the chickpeas well and place in a large bowl. Set aside. Meanwhile boil 1 cup of water. 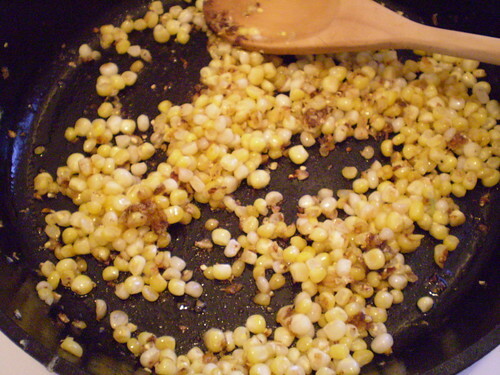 Place chopped onion and garlic in a small bowl and pour the boiling water over them. Let sit for 1 minute to mellow out the raw onion, garlic taste. Strain. 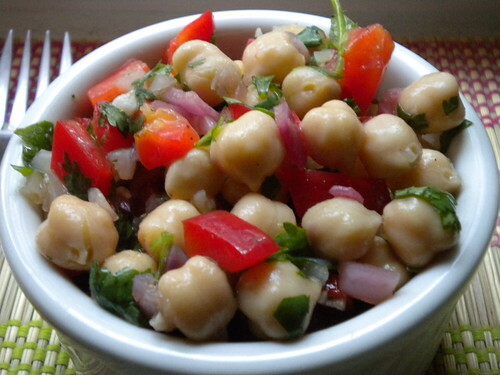 Combine chickpeas with the chopped red pepper, onion, garlic, and cilantro. 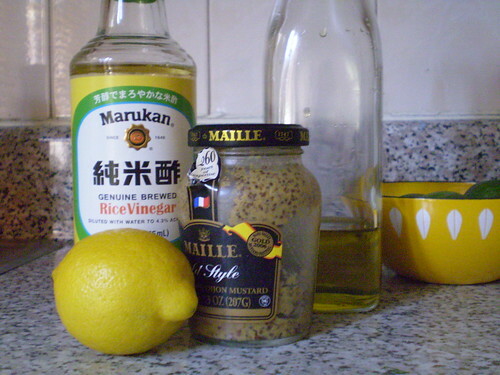 Next make the vinaigrette by combining the vinegar, cumin and honey in a bowl. Whisk as you pour in the olive oil to emulsify. Add salt and pepper to taste. Pour over the salad and toss well. Taste again to see if it needs more salt. 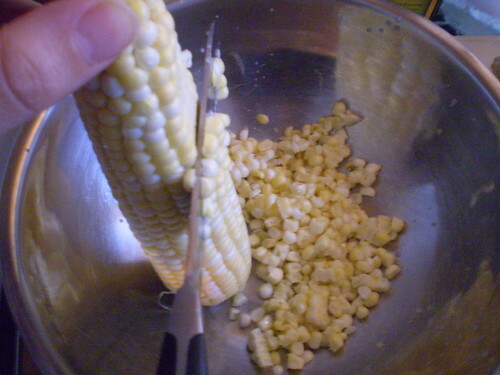 Before serving, squeeze half a lime over it to brighten the flavors a bit. I recently took a ride about an hour and half north of NYC, through bright fall foliage, to Warwick to go apple picking with my family. Masker Orchards, is a pick your own orchard is a huge orchard that's very kid friendly (think petting farm, pony rides and very short trees). Too bad the only kid with us, was sleeping. That didn't stop me from filling up my bag with Jonagolds, Ida Reds, McIntosh, and various others. As I picked, I had visions of apple strudels and apple tarte tatins in my head. I even thought about trying to make apple butter when I got back to Brooklyn. 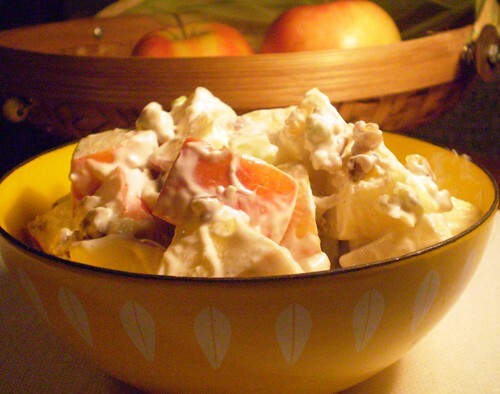 But instead, after too much obsessing over the end of Mad Men, and how to dress as Joan for Halloween, an old retro-classic popped into my head, Waldorf Salad. I have always been intrigued by the name of this salad, but I do not recall ever eating it. It was the kind of thing I saw in the yellowing pages of my grandmother's cookbooks, and frankly something I thought was the epitome of dated cuisine. Still, to me (and my overactive imagination) the name alone, evoked images of days long gone and ladies who lunched (I hear those ladies still exist somewhere) and lettuce leaves filled with salads with fussy names served on fine china. But, to my surprise, I found a little version from the classic vegetarian cookbook, The Moosewood Cookbook, by Mollie Katzen that made me think this simple salad with the fancy name might actually be tastier than I had assumed. I consulted my trusty Fanny Farmer, just to see if a more original version of the recipe differed much. It didn't, with the exception of blue cheese. My thought process went something like this, "Blue cheese? Apples? Sold!" 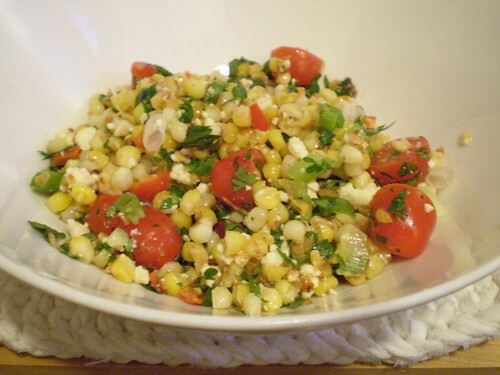 This salad is a breeze to put together once you chop up the few ingredients, mix the dressing and then toss together. Cooking 101, except these flavors mixed together are nothing to brush off as simplistic, or dated. I want to bring it back. 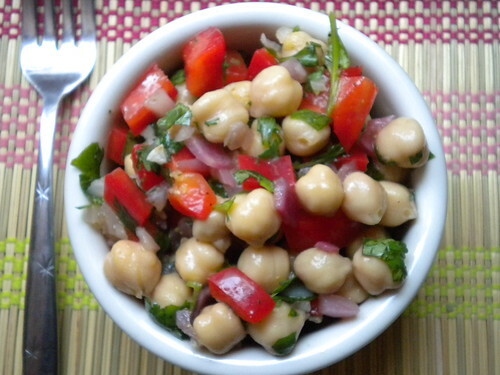 Give it a try, serve it for lunch, serve it as a snack, or part of an appetizer spread, just don't serve it in a lettuce cup, and I think you'll see that this salad should come back into fashion. 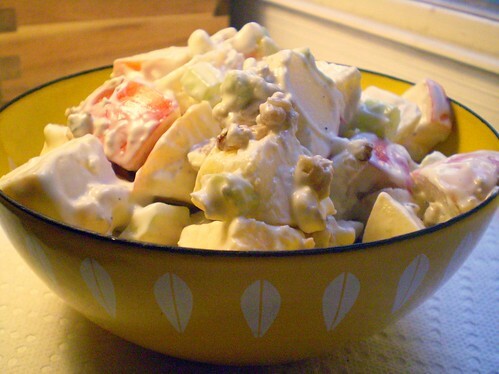 Waldorf Salad Adapted from The Moosewood Cookbook. 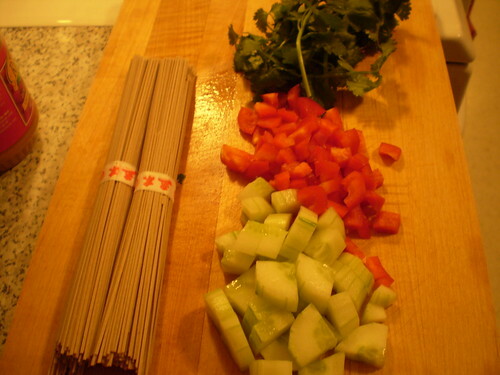 Chop apples, celery and scallions. Toast the walnuts. Mix together. Crumble the blue cheese, or break it up using the back of your fork. Mix with yogurt, mayonnaise, and honey. 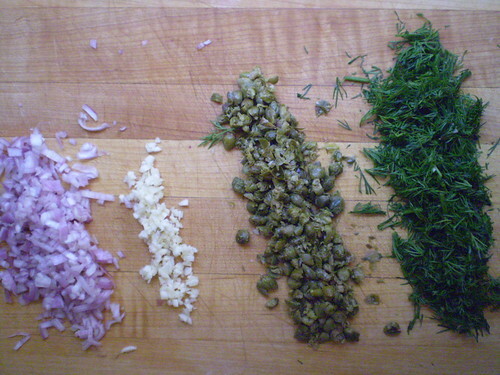 Toss salad ingredients with dressing. 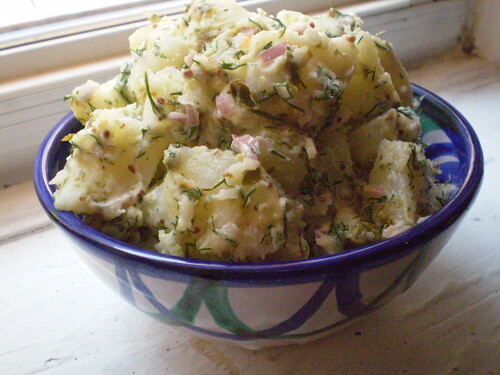 Feel free to add more apples or even pears if the dressing to salad ratio is too heavy.